With the release of the 600 litre integrated secondary-product saddle tank and fluid system, the Hardi Saritor now provides farmers with the option to fit cameras to save thousands on herbicide costs. The escalating cost of knockdown and desiccation herbicides can be controlled by using the aftermarket Weed Seeker camera technology. 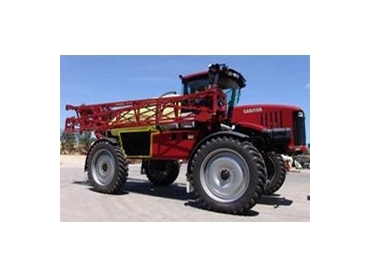 Hardi engineers recognized the importance of this technology and have fast tracked the development of the optional saddle tank fluid system to meet the demand brought on by herbicide costs. Weed Seeker is an independent aftermarket product that recognizes weeds and activates a precise application of herbicide to the target. There is no wastage. “Contractors and farmers impressed upon Hardi development engineers the need to facilitate the weed recognition technology, as there was no off-the-shelf solution”, said Corrie Eichner Saritor product manager. The saddle tank fluid system compliments the 4800L Saritor fluid system, both with its own Hypro centrifugal pump which can work in unison or alone. The tank is fitted with a sight gauge for content level, removable lid with mounted breather, agitation and filling ports. The fluid system is plumbed to a separate bank of EC distribution valves on the boom which is in turn plumbed to the Weed Seeker nozzles. Both distribution valve banks can be controlled by auto swath control guidance packages. In order to carry the additional weight of the cameras Hardi engineered a heavier 24 metre boom solution. This utilizes the existing 36m Force boom inner wing along with the 24m FORCE outer wing and a custom breakaway section of 1.5m. “To safeguard the additional cost of the camera technology fitted to the boom and to optimise herbicide application, we recommend the addition of boom AutoHeightControl” Corrie explained.